Nauradehi Wildlife Sanctuary is a reserve in Madhya Pradesh, India. It is a potential site for Cheetah Reintroduction in India. The wildlife sanctuary with an area of 1197 km? is based near Jabalpur, Damoh and Sagar Towns of Jabalpur. Gangotri National Park is a national park located in Uttarkashi District Uttarakhand, India. The size of this national park is about 2,390 square km. The Palani Hills Wildlife Sanctuary and National Park is a proposed Protected area in Dindigul District, Tamil Nadu State South India. Rajaji National Park is an Indian national park & Tiger Reserve that encompasses the Shivaliks, near the foothills of the Himalayas. It is spread over 820 km?., and three districts of Uttarakhand: Haridwar, Dehradun and Pauri Garhwal. Tadoba Andhari Tiger Reserve is a Tiger reserve in Chandrapur district of Maharashtra state in central India. 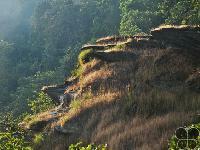 It is notable as Maharashtras oldest and largest National Park. It is one of Indias 43 Project Tiger Tiger reserves. Papikonda National Park is located in East Godavari and West Godavari districts of Andhra Pradesh and Khammam district of Telangana, with an area of 1,012.86 km?. Valmiki National Park and Wildlife Sanctuary is located in the West Champaran district of Bihar state, India. The extensive forest area of Valmikinagar was previously owned by the Bettiah Raj and Ramanagar Raj until the early 1950s. Kinnerasani Wildlife Sanctuary is located in Khammam district, Telangana state of India. The wildlife sanctuary is spread over an area of 635.40 km? with the picturesque Kinnerasani Lake with densely forested islands in the middle of the sanctuary.